George Ireland, junior, was the son of George Ireland, house agent, Blackness Terrace, Dundee. He worked in the flax and jute industry until his early death from chronic bronchitis and asthma. His final business partner was Henry Boase. George Ireland appeared in the 1851 census, as a 'mill spinner's clerk,' in his early twenties. 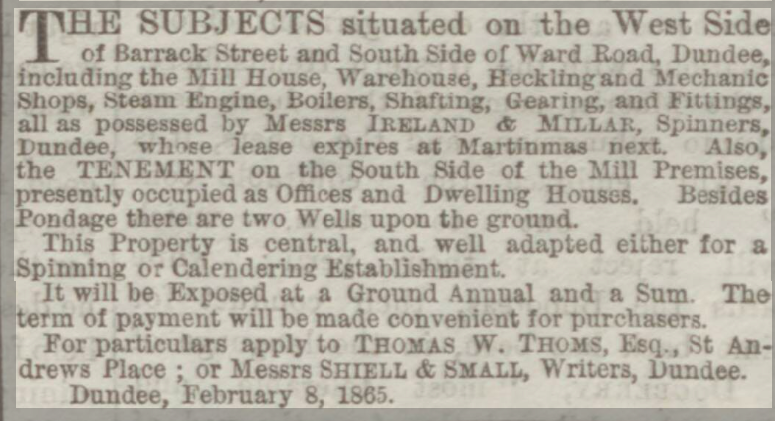 In 1854, an advert was placed in the local press regarding Barrack Street Mill for sale or let. The Dundee Directory of 1856-57 saw the first listing of George's concern ' Ireland & Millar' operating from the said Barrack Street Mill. As flax spinners and manufacturers, George Ireland and his partner James Millar worked Barrack Street Mill continuously until James' death in 1861. George Ireland then continued operating Barrack Street Mill with James' widow Betty as his partner. 1862 saw the dissolution of their partnership. At the time of pledging his subscription for the Albert Institute, George was the sole partner of Barrack Street Mill, the smallest mill in town. George Gunn Ireland (k/a junior) was the son of George Ireland, a house factor, and his wife Janet Leslie. 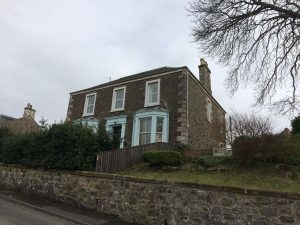 Having grown up in Dundee, he appeared in the 1851 census, together with his soon to be wife, Janet Bell and her brother David, at Kirkton of Auchterhouse. At the time, George was listed as a ‘Millspinner’s Clerk.’ The location of his employment as a clerk may only be surmised. It is possible that George’s connection with Barrack Street Mill began before he became its operative owner. Barrack Street Mill was built in 1833 when George was but a boy. Owned by brothers William and George Thoms (another brother David was employed as a clerk at the works) it was located on the west side of Barrack Street. A notable fact about the mill was, that at its inception, the person responsible for operations was Peter Carmichael – who was later to become a renowned mill manager and engineer and the only non-family partner of Baxter Brothers. 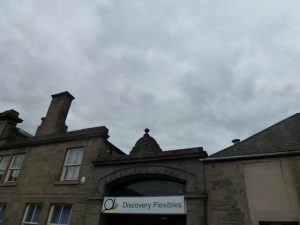 It was written by him, “My first occupation after my return to Dundee in August 1833 was the starting of a new mill belonging to ‘Thoms Brothers & Co.’ It stood at the corner of Barrack Street and is now part of the works of ‘Don Brothers, Buist & Co.’ (from 1873). The machinery, which was of the most approved kind, was driven by an engine of 16 hp. The mill was kept going busily and produced good yarns………..I had not been there long when he did some things which displeased me and it was reported that I was going to leave. Upon this, Mr William Baxter had a consultation with me and engaged me as manager of the new mill his firm were building in the Upper Dens and I entered my duties there on Friday, 6th December 1833. Not long after his marriage to Janet Bell, an advertisement appeared in local press in 1854 – ‘Barrack Street Mill for sale or let.’ Within the sale were listed – ‘Steam Engine, Machinery, Turning Lathe etc. 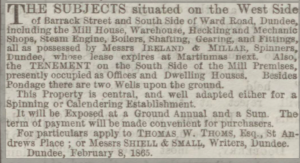 Besides the mill are Counting House, Warehouse accommodation, Tow Shaking House etc.’ That George Ireland and James Millar rose to the call of the advert, shortly thereafter, to form the company of ‘Ireland & Millar,’ is surely in little doubt. 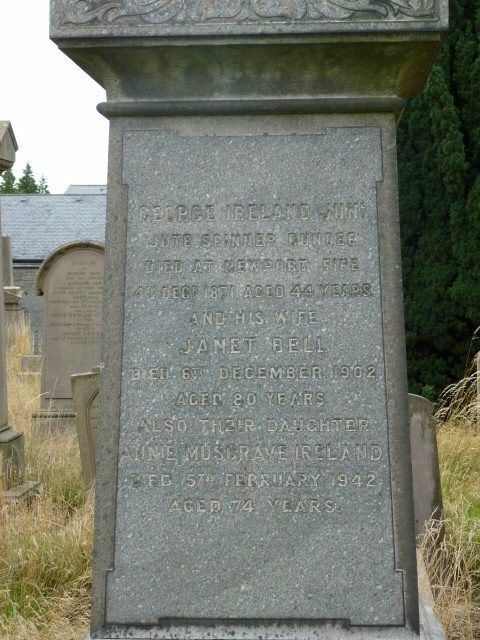 George gave his daughter Helen the name ‘Millar’ (a mark of respect perhaps) at the time of her birth in 1855. The Directory listed them as a going concern in 1856-57. Their venture may have been a modest one. 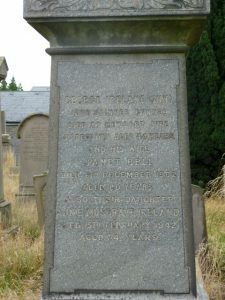 At the time of James Millar’s death, the value of his share as a partner in the company amounted to £355. He had also been a registered owner (with an eighth share) of the vessel ‘Queen Hortense’ of Dundee, the shares from which formed part of the stock and assets of the said firm. 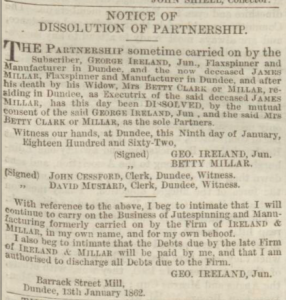 After the dissolution of their firm, George Ireland continued to operate Barrack Street Mill for a few years more, until the expiry of the lease in 1865. Old Parish Register. Dundee. Birth. (1827). 282/ 160 87. ScotlandsPeople website. Old Parish Register. Liff, Benvie & Invergowrie. (1852). 301/40 383. ScotlandsPeople website. Census Record. 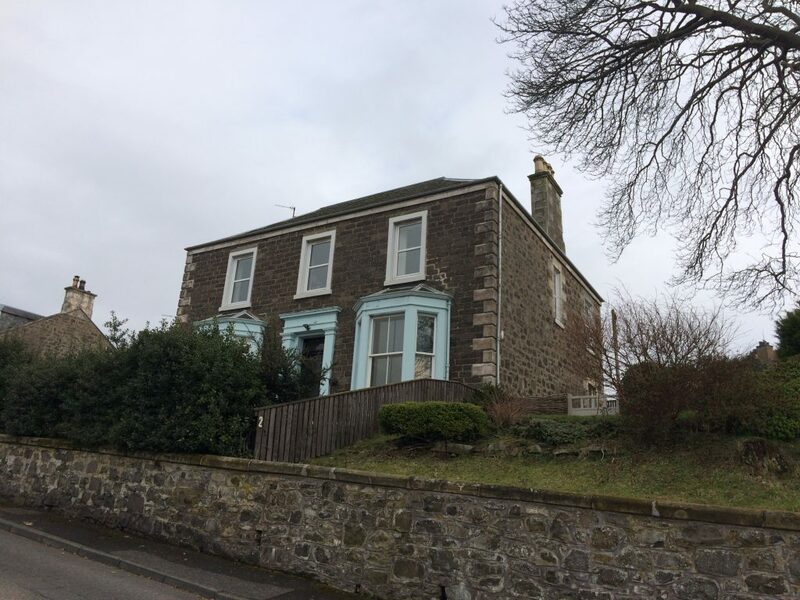 Forgan, Fife. (1871). 431/ 4/ 16. ScotlandsPeople website. Dundee Postal Directory, 1858-59. p.143. Dundee Central Library, Local Studies. Dundee Directory, 1867-68. DundeeCentral Library, Local Studies. Dundee Postal Directory, 1869-70. p.148. Dundee central Library, Local Studies. Statutory Registers. Forgan. Deaths. (1871). 431/28. ScotlandsPeople website. 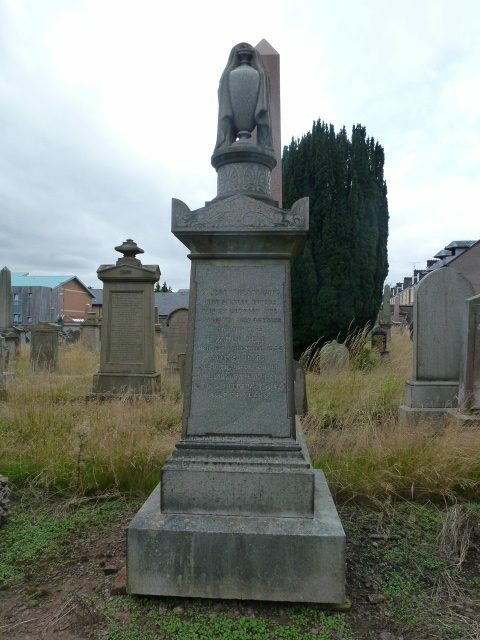 Old Dundee Graveyards and other Burial Records. Western Cemetery. Friends of Dundee City Archives website. Dundee Directory, 1856-57. Dundee Central Library, Local Studies. Dundee Voters' Register, 1865-66. Friends of Dundee City Archives website. Census Record. Auchterhouse. (1851). 273/ 3/ 5. ScotlandsPeople website. 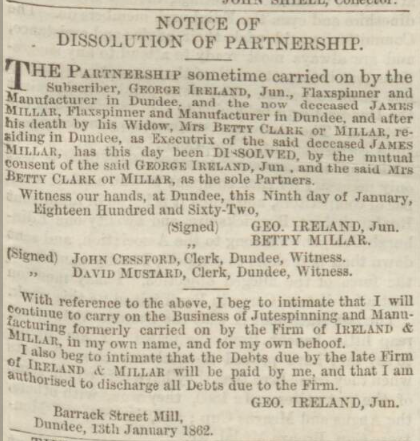 Dundee, Perth & Cupar Advertiser, 12 May 1854. p.2. Findmypast website. Legal Records. Wills & Testaments. Dundee Sheriff Court. (1863). SC45/31 18. ScotlandsPeople website. Dundee Advertiser, 14 January 1862. p.1. Findmypast website. Watson, Mark. (1990). Jute and Flax Mills in Dundee. p.195. Tayport. Hutton Press Ltd.
Gauldie, E. (ed.(1969). The Dundee Textile Industry, 1790-1885 from the papers of Peter Carmichael of Arthurstone. Scottish Historical Society, 4 Ser. Vol 6. pages 52-53. Edinburgh. Dundee People's Journal, 11 February 1865. Findmypast website. Dundee Directory, 1867-68. Dundee Central Library, Local Studies. Dundee Courier, 13 May 1889. p.3. Findmypast website. Wellfield Works. British Listed Buildings website. Watson, Mark. (1990). Jute and Flax Mills in Dundee. p.233. Tayport. Hutton Press Ltd.
Dundee Postal Directory, 1875. Dundee Central Library, Local Studies. The information above about George Gunn Ireland has been collated from a range of digital and hard copy sources. To the best of our knowledge it is correct but if you are relying on any information from our website for the purpose of your own research we would advise you to follow up the sources to your own satisfaction. If you are aware of an inaccuracy in our text please do not hesitate to notify us through our Contact page.